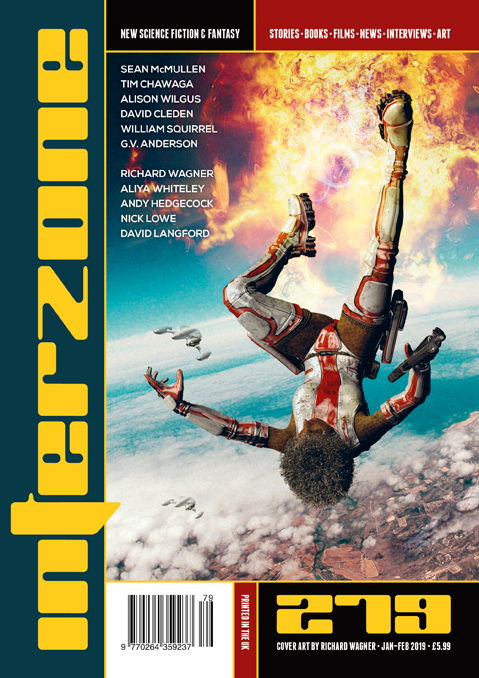 "The Backstitched Heart of Katharine Wright," by Alison Wilgus [bio] (edited by Andy Cox), appeared in Interzone issue 279, published on January 1, 2019 by TTA Press. Pro: Those familiar with the actual history of the Wright family will realize that Katherine reaches our reality before her final jump into the past. In our world, Wilbur really did die from typhus, and years later when Katherine married, Orville never spoke to her again until she was on her deathbed. In this story, they all get a happier ending. The “Ullam” in the story is Wilbur Wright’s family nickname and “Bubs” is Orville’s. Con: It’s mostly a recounting of the historical record with small snippets of story. Katherine’s power has no cost and causes no unexpected problems. As a result, there’s not much tension or excitement.